About "Integers and absolute value worksheet"
Integers and absolute value worksheet is much useful to the kids who would like to practice problems on absolute value and absolute value equations. Please click here to download "Solving absolute value equations pdf"
Before we look at integers and absolute value worksheet, let us look at some basic stuff about solving absolute value equations. "Solving absolute value equations" is the stuff which is being studied by the students who study high school math. Here we are going to see, "How to solve an absolute value equation"
Let us consider the absolute value equation |2x + 3| = 5. 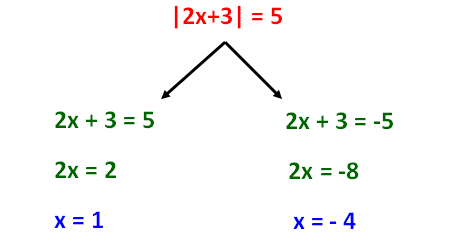 The picture given below clearly explains, "How the above absolute value equation can be solved". 9) If the absolute value equation |2x+k| = 3 has the solution x = -2, find the value of "k". 10) If the absolute value equation |x - 3| - k = 0 has the solution x = -5, find the value of "k". Let us look at the next problem on "Integers and absolute value worksheet". Hence the solution is x = -3, 3. Hence the solution is x = -2, -3. Let us look at the next problem on "Integers and absolute value worksheet"
Hence the solution is x = 3, 3. Now, let us look at a problem on "Integers and absolute value" with quadratic polynomial in absolute sign. Here we have quadratic equations. This quadratic equation can not be solved using factoring. Because the left side part can not be factored. So, we can use quadratic formula and solve the equation as given below. Now let us look at some quiet different problems on "Integers and absolute value"
If the absolute value equation |2x+k| = 3 has the solution x= -2, find the value of "k". Since x = -2 is a solution, we can plug x = -3 in the given absolute value equation |2x+k| = 3. If the absolute value equation |x - 3| - k = 0 has the solution x = -5, find the value of "k". Hence the value of k = 8. After having gone through the step by step solutions for all the problems on "Integers and absolute value worksheet", we hope that the students would have understood how to do problems on "Integers and absolute value worksheet". If you want to know more about "Integers and absolute value worksheet", please click here.